Samsung's highly promoted Bixby voice assistant won't be shipping with the Galaxy S8 smartphone on April 21, as previously announced. The company released a statement Tuesday night that said Bixby will be available in the U.S. on the Galaxy S8 "later in the spring." Samsung didn't explain the delay. The Bixby will join a pack of artificial intelligence assistants that includes Amazon's Alexa, Apple's Siri and the Google Assistant that are changing the way people interact with their devices. Some U.S.-based reviewers and analysts had noticed that the Bixby feature wasn't fully demonstrated when the S8 was announced March 29. Also, some news reports said Bixby encountered voice recognition problems in English compared to its performance with the Korean language. 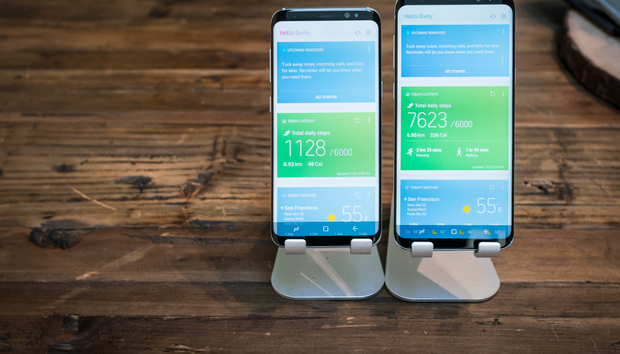 The shipment delay applies only to the voice feature in Bixby, while Samsung said other key features of Bixby, like Vision, Home and Reminder will be available in the global launch of Galaxy S8 on April 21. Samsung went out of its way to promote Bixby well in advance of the Galaxy S8 launch. It was announced in a blog on March 20, nine days before the phone's launch, by Injong Rhee, executive vice president of software and services for Samsung Electronics. Rhee pointed out a physical button on the side of the phone that would activate Bixby, differentiating it from Alexa or Siri and others that are activated by a spoken trigger word. Bixby would offer a "deeper experience" than some others, including support for touch commands. Also, Bixby is designed to know the current state of an app to allow users to carry out work in progress without further explanation. Rhee said the Bixby interface is "much more natural and easier to use." Bixby was already two years behind those digital assistants as well as Google Assistant, analysts said. "Bixby is going to be playing catch up," said Gartner analyst Werner Goertz in March. One analyst forgave the Bixby delay. "I commend Samsung for trying to get it right rather than just launching and hoping for the best," said Jack Gold, an analyst at J. Gold Associates. "It's never a good idea to put out less than great software on a consumer device. So in this case, if Samsung can delay a few weeks and get a better product, it makes sense to do so. That said, voice recognition generally is not all that easy to do. It's not just the recognition software itself, but the whole voice chain that has to be tailored. That includes everything from the microphone through the audio channel on the phone to the recognition algorithms and the user interface. If they tested and it wasn't at their expected level of accuracy, then it's better to get it right than to get it out fast." On Wendesday, Goertz agreed with Gold. "Yes, the delay is disappointing … but Samsung's postponement of Bixby voice is still better than launching a virtual personal assistant that is not entirely ready for prime time."